← What Can I Do? Press for Progress…. A couple of weeks back I undertook another trip to Europe. A trip that got extended by nearly a day due to snow which disrupted my travel plans, thereby making it impossible for me to get back to the UK as planned. The trip was another opportunity to ponder what we are losing as we head off into #Brexitshambles. Once again I was there in my capacity as a Scientific Council member of the ERC and this time the visit was to EMBL in Heidelberg where the Plenary Meeting was held. There is absolutely no doubt that every time I attend one of these meetings there is something new to provoke a focus on the myriad undesirable consequences of that vote in June 2016. I flew into Frankfurt Airport. On the flight, when the joys of editing some text had failed to keep my concentration fixed, I turned to the book of the moment on my Kindle. This was Millions Like Us: Women’s Lives in the Second World War by Virginia Nicholson. Having just been reading some searing accounts of the Blitz and how women coped in London, flying in over a city that too had been heavily bombed and looking at all the buildings constructed in the 70 odd years since, I couldn’t help making the connection with the fate of so much of London. The buildings, lives and loves lost in Frankfurt by the UK’s forces; a medieval city centre destroyed. A clear parallel. For many of those who survived the war, the European Union (under its different names over the years) was a way to ensure neither side could bomb the hell out of the other again. I think of my mother, like so many of the women in Nicholson’s book, a woman whose life was utterly disrupted and reshaped by the war, surviving the death of friends and family and the roles and education she was and was not allowed to assume. No active service for her – she was too young – but she was proud of her role in the Royal Observer Corps where, certainly at one point she was one of only two women who achieved the level of Master pass in aircraft identification. Not, as I discovered towards the end of her life, that she got much opportunity to tell a Messerschmitt from a Junkers, as German planes rarely got to her part of the country, but even when I was a young child she would pepper her conversation with tales of the Master Test and the planes. Those names were, now I look back to my childhood, curiously often mentioned. I found her test papers amongst her belongings after her death: this was, as for so many women of her generation, an incredibly formative period for her despite its horror and stresses. But flying into Frankfurt it seemed to me that we have forgotten that history of nations tearing each other apart. We are scrapping our post-war idealism, selling it for a mess of pottage* that is worth little to many of us (though possibly a lot to a few of the politicians who are pushing Brexit so hard upon us). EMBL (European Molecular Biology Laboratory) itself, where the ERC meeting was held, is equally testament to shared visions. 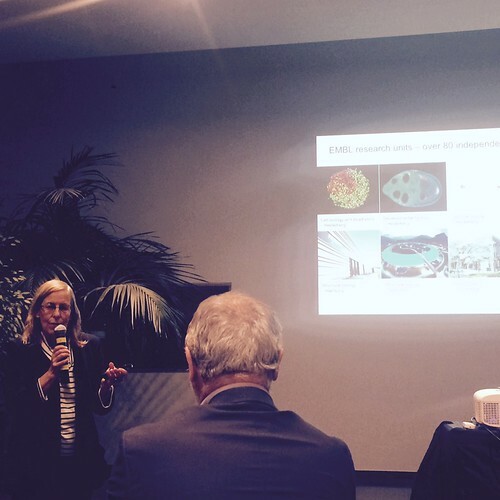 Created soon after the war to be a centrepiece for biological sciences in Europe under EMBO (the European Molecular Biology Organisation) it, like CERN, sits outside the EU and will still be accessible to UK scientists come what may. While the rest of us try to deconstruct Science Minister Sam Gyimah’s remarks and the latest Government position paper as regards access to the next Framework Programme, UK researchers attached to the various institutes associated with EMBO, of which EMBL is one, do not need to worry. In the UK the key institute is the EBI (European Bioinformatics Institute), located close to Cambridge. Until recently this was headed by Janet Thornton, a fellow member of the ERC Scientific Council. EMBO itself is currently headed up by Maria Leptin. Janet explained all these different relationships to us over an informal dinner. Close to International Women’s Day it is perhaps worth pausing to note that here are two female leaders in (molecular) biology who have made so much difference to their field. 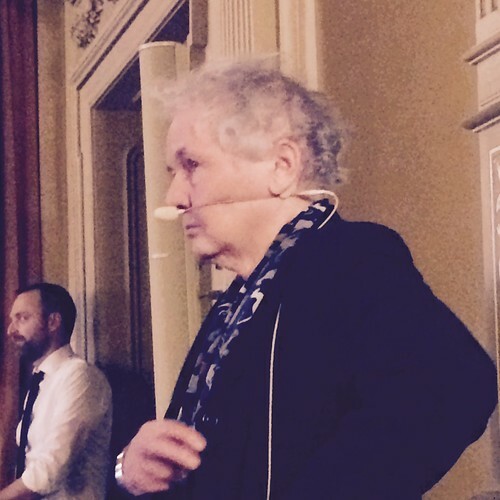 And, to round up the strong female presence during this trip I should mention the speaker at the formal dinner held in Heidelberg: Christiane Nüsslein-Volhard, pictured below and 1995 Nobel Prize Winner in Physiology or Medicine, (shared with Eric Wieschaus), who spoke to us about skin patterns in fishes. I come away depressed that all the scientific community stands for and appreciates in terms of internationalism and of mobility of researchers; all the joint efforts after the war to bring peace to the continent, seem to be heading for the scrap heap. Once again it is clear that, to organisations like the ERC, the UK’s scientific strengths are so obvious they would love to find a way to keep us within the fold. With the Government itself so tied in knots over everything from the Irish Border to financial passporting, it is hard to see them wanting to pay much attention to science. They should. Of course they should. But their troubles over trade and immigration take centre stage and the science community can only press as hard as they can and try to remain optimistic that the structures that make our research thrive are not carelessly destroyed as ideology wins out. * Spelling of pottage corrected March 18th 2018! This entry was posted in Research, Science Culture, Science Funding and tagged EMBL, ERC, Frankfurt, Janet Thornton. Bookmark the permalink. I have just bought a newly-published book “Cultural Dementia” by David Andress (a historian whose speciality is the French Revolution and what followed it), which claims to cast light on why this country voted for Brexit (and America for Trump).